Good morning! I am waking up this lovely Sunday morning and feeling so very blessed. These first photos are of wonderful display scenes that were left for us to take photos of our Sasha dolls. They have a backdrop of seasonal variations of beautiful Minnesota landscapes and nice props. Finn and Gracie both volunteered for this fun time that I enjoyed too. Finn and Sammie playing in the leaves. Finn playing in the snow with his sled and snowmen. His new outfit was perfect for this scene. Gracie relaxing at the lake. Gracie loves the Fall leaves. Her necklace was from the sales room. Sadly we did not find her a dress but she loves her necklace. A fun stage scene and doll stands were provided which promoted Gracie to dance for us. Norvell’s beautiful doll plays with Gracie. Photos of the gathering in the ballroom for the fantastic dinner meal. Beautiful dolls everywhere. Virginia Myers’ most beautiful doll and outfit. After eating, we viewed a wonderful movie showing the lovely girl touring the Sasha factory in England and having her Gregor made by the lovely people working there. 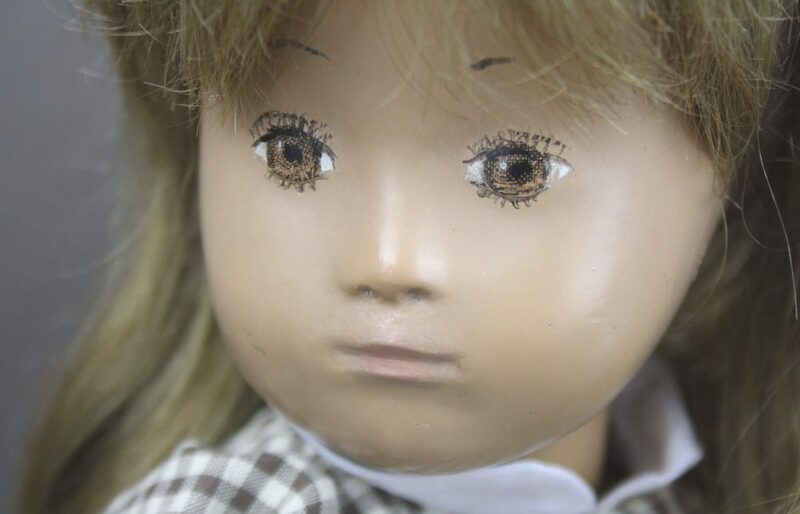 Brenda Walton was interviewed and photos of Sasha dolls were shared. A great presentation. A guest speaker talking about Minnesota authors and I especially enjoyed learning more about Laura Ingalls because I so loved the TV series “The little house on the Prairie “. The Festival gift is a fabulous Sherpa lined coat with hood and wooden toggles. I will take better photos later. What a wonderful gift and all of them were made by the very talented JoAnn Staricha. The four raffle offerings are full of great Sasha items. Last night ended with helper drawings which were so nice to generate funds for the next year’s Festival. And, guess what we won? A fantastic knitted dress coat for Gracie! She is over the moon that she did get her dress after all. She said it was because she had been a very good girl. I have to agree. Today I leave early in order to catch the flight hone. I will take photos but I will miss the second round of helper drawings and the raffle drawings. It could not be helped though in order to get home today. I have had the very best time and this Festival has been a tremendous success. I am so thankful to all of the Minnesota team that worked so hard to provide us a happy time with friends and Sasha dolls. Another fantasic Festival post. Many thanks indeed Ginger. I was sorry when I heard that Gracie wasn’t able to get the new dress that she had hoped for but this pretty little knitted coat and her smart Sasha logo necklace I’m sure more than makes up for it! Dearest Finn was certainlty a WINNER in the Auction… and how smart he looks in it. Bless him! He is so deserving of this treat as he is always the perfect gentleman. Fab Festival coat outfit. They look so warm and cosy both on and off. Gosh imagine making ALL those and on your own. A wonderful achievement. Sorry to hear that you had to leave early this morning in order to catch your flight home but I’m sure you’ll be able to see and hear later as to who won those super raffles and rest of the helpers gifts. Safe flight home and thanks again for these very much Festival appreciated posts. I cannot imagine making one of those coats and certainly not over 100 coats! JoAnn is incredibly talented and generous. I agree, a wonderful achievement. Thank you JoAnn! It was so nice to meet you Ginger. John and I had a wonderful time at our first festival. Such fun! Finn is certainly a handsome lad in that amazing Diane Duke outfit. Dear Ginger, it was an absolute delight to get to know Finn and Gracie during my this wonderful Sasha celebration. Finn is the most handsome young man in his Mini-Kaffe tumbling blocks sweater with matching shoes and cords and Gracie is so sweet in her new spring coat. Thanks for sharing all your experiences with us Ginger and Gracie, I am so glad Gracie won such a beautiful knitted outfit, she deserved it after dancing for everyone on stage! Such a lot of Sasha fun in one post. It looks like you had a very good time there Ginger! !